Homemade nut milk is worth the extra effort and time over store bought because the taste is just incomparable! But homemade nut milk comes with one issue: what are you supposed to do with the leftover pulp? I was tasked by my boyfriend (homemade nut milk’s number one fan if there is such a thing) to come up with a recipe to use up our latest leftover pulp from making hazelnut milk. 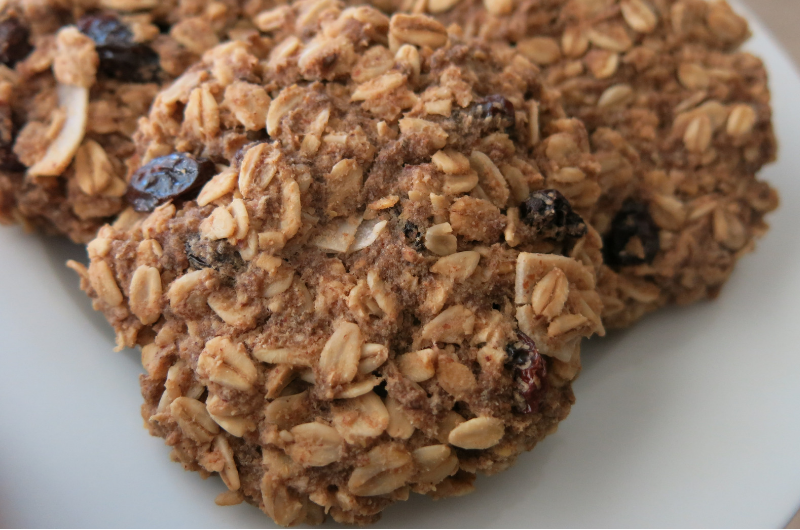 My response was these breakfast cookies which are a great back-to-school snack for busy mornings or for an after-lunch treat. The cookies are gluten free, refined sugar free, and plant-based – a perfect recipe for those with food allergies or sensitivities. 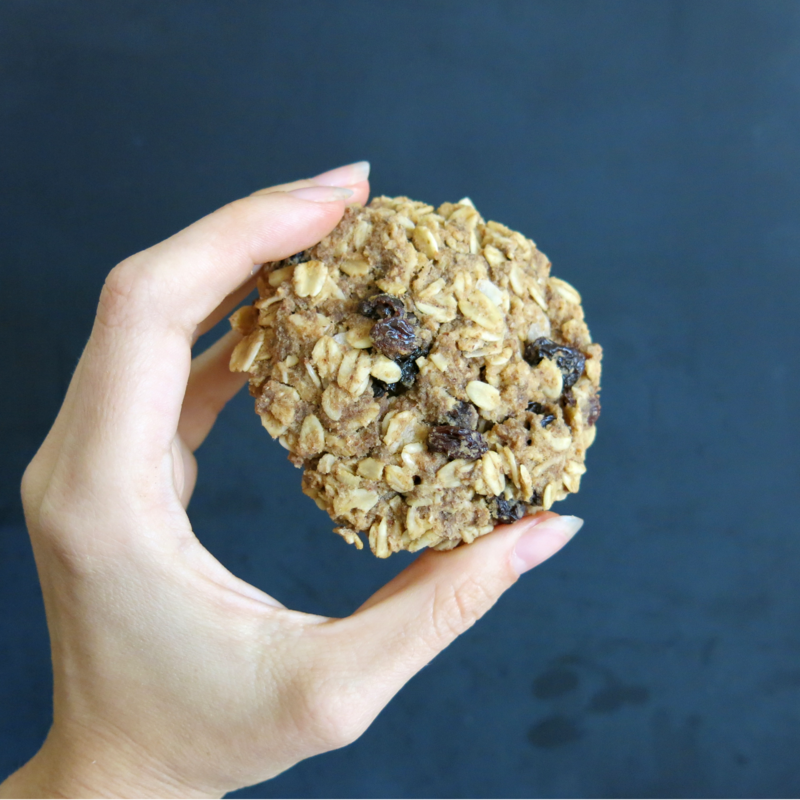 With rolled oats, chia seeds, and nut flour my cookies boast more protein, minerals, and vitamins than other breakfast indulgences! They are moist and tender, while also healthy and delicious! Make your chia eggs in a small bowl and set aside. Flax seed meal will work too. In a large bowl add rolled oats, nut pulp, baking powder, cinnamon, and salt and whisk the mixture to ensure that there are no clumps. In another large bowl add nut milk, nut butter, coconut sugar, maple syrup, melted butter, and vanilla. Whisk to combine. It may look like the nut butter will not mix well into the other wet ingredients but give it just a few extra stirs and it will! Add the wet ingredients to the dry and mix well. Caution: the batter is not as delicious as you would hope! Skip licking the spoon this time and wait until the finished product! Scoop a large spoonful of the batter into your palm and form cookies shaped about 4” wide and ½” thick. Place the formed cookies onto a greased cookie sheet and bake them for 18-21 minutes, until firm and slightly golden. The cookies will not rise or spread much so it is important to form them into the desired shape before baking. Allow cookies to cool before removing from the pan or eating – otherwise they will be crumbly! *I have only tried this recipe with nut pulp, the leftovers of blending soaked raw nuts in water to make nut milk. The recipe will likely work with store bought almond flour, but the cookies might not be as tender or moist. A moist, tender, and comforting recipe for back to school that utilizes leftover nut pulp! Talk about multitasking.